Pioneer Electronics (USA) Inc.’s Professional Sound and Visual Division today introduces its first line of active reference monitoring speakers, S-DJ08 and S-DJ05, designed for DJing and music production. The two speaker models feature excellent sound quality, audio parameter control, built-in linear equalization and four switchable inputs, useful for DJs and producers who need to achieve the highest accuracy in musical reproduction. In addition, both speaker models offer users the ability to change settings such as sound characteristics and audio inputs via a unique manual controller. The compact speakers achieve a larger than normal listening area due to the use of a curved waveguide enclosure that directs the soft-dome tweeter’s sound in a wider pattern for better imaging and staging. This means more listeners across a larger area of a room can hear the higher frequencies than with traditional designs. Additionally, the Bass Reflex enclosure extends the lower frequency range to provide more mid-bass and bass output. In order to reproduce the highest quality audio possible, the speakers are also equipped with strong 10cm high-force magnets (S-DJ08) for better control of the subwoofers, a low resonance chimney-style heat sink and a bi-amp circuit that drives the tweeter and woofer separately. Whether the speakers are utilized for DJing or producing music, the built-in linear equalizer provides further fine-tuning of sound for all listeners’ tastes. The linear equalizer allows users to adjust the low and high bands from -6 dB to +6dB helping to enhance the tonal quality of instruments while producing music or recreate the low frequency sound of a club while DJing for a more realistic experience, important for critical listeners. Unique to Pioneer’s DJ speakers, the included control accessory allows users to simultaneously operate the volume, power and four switchable input channels of both speakers. The dial style control knob also engages the equalizer and muting of both speakers. Both S-DJ08 and S-DJ05 speakers feature four types of inputs (XLR, TRS and two sets of RCA) that let users connect various devices simultaneously, such as a computer, DJ equipment, portable device, etc. The various inputs eliminate the need to change cable connections so the speakers can be utilized with a broad variety of sources. 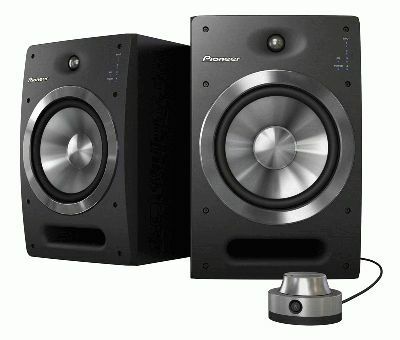 The S-DJ08 will be available in January 2011 for a suggested retail price of $1,199/pair. The S-DJ05 will be available in January 2011 for a suggested retail price of $899/pair.